The first formal CPR guidelines advocated by the American Heart Association included a statement that "elevation of the lower extremities may promote venous return and augment artificial circulation during external cardiac compression"
Rescue 16 and Engine 43 arrive on scene of a reported unconscious person. At the patient's side, the team finds a pulseless and unresponsive man. The patient's wife reports that Mr. Johnson suddenly complained of chest pain about 15 minutes ago and sat down on living room chair. After calling 911, he collapsed to the floor. Mrs. Johnson began cardiopulmonary resuscitation (CPR) immediately, as the 911 operator talked her through the procedure. The firefighters take over CPR while the medics place the patient on the monitor/defibrillator. The presenting rhythm is ventricular fibrillation (VF). Medic Simmons instructs the firefighters to continue CPR while he charges the defibrillator. Once charged, Simmons "clears" the patient and delivers the shock. The firefighters immediately resume CPR. The medics turn on a metronome to assist the firefighters in maintaining the proper compression rate. Bag-mask ventilation is effective. While his partner is obtaining intravenous access, Simmons asks one of the firefighters to pull the cushions off the couch and place them under the victim's legs. At the end of the two-minute period of CPR, the patient remains in VF, and receives a second countershock. The firefighters immediately resume CPR with a new chest compressor. Medic Simmons notices the countershock produced an organized rhythm. He decides, therefore, to delay administration of the epinephrine. At the end of the two-minute CPR cycle, the patient remains in an organized rhythm. One of the firefighters confirms the return of spontaneous circulation (ROSC). Firefighters continue providing assisted ventilation while transferring the patient to a backboard. Simmons replaces the couch cushions under the patient's legs with the airway and medical kits. By the time the ambulance arrives at the emergency department (ED), Mr. Johnson is breathing on his own and following simple commands. One of the emergency nurses asks why the patient's legs are elevated. Simmons explains that it increases the resistance to blood flow in the lower extremities and improves circulation in the upper part of the body, much in the same way as for hypovolemic patients. The nurse is skeptical but continues preparing the patient for transfer to the cardiac catheterization lab. Later, the nurse wonders if elevation of the patient's legs really improved cardiac output and contributed to the success of the resuscitation. Researchers in Sweden attempted to explore two issues related to PLR and end-tidal carbon dioxide (PETCO2) levels (Axelsson, Holmberg, Karlsson, Axelsson, & Herlitz, 2010.). First, they wanted to know what effect PLR during uninterrupted CPR had on PETCO2 levels. Next, they want to compare PETCO2 values between patients who ultimately achieve ROSC and those who do not. This study was an observational sub-analysis of patients already enrolled in a prehospital mechanical chest compressions study. Some, but not all ambulances in that EMS system were equipped with a mechanical active compression-decompression CPR (ACD-CPR) device. Upon arrival at the scene, medics immediately began manual chest compressions on every pulseless patient. If the ambulance was equipped with the CPR machine, the medics applied the device as quickly as possible after beginning manual chest compressions. If the machine was not assigned to the ambulance, the medics performed high-quality manual chest compressions for the duration of the resuscitation attempt. After ensuring adequate chest compression in the two groups, medics performed endotracheal intubation, confirmed tube position with quantitative waveform capnography, and placed the patients on a volume-controlled ventilator. The medics standardized the tidal volume and rate to deliver 100% oxygen at seven liters per minute. Although the medics could continuously monitor the capnography waveform and PETCO2 levels, researchers programmed the monitors to record the expired carbon dioxide levels automatically every 30 seconds. Five minutes after the first PETCO2 measurement, medics selected a group of these patients to receive PLR. In order to ensure uniform leg elevation, the researchers trained the medics to raise the patient's feet to the height of the monitor/defibrillator, which was 35 cm tall. This provided an angle of 20 degrees from the plane of the back. In the study population, the researchers collected three PETCO2 measurements, two immediately before PLR, and the last recorded value after. The authors of the study are unclear as to how the medics chose the group of patients to receive PLR. Figure 1 is a timeline of events surrounding the study population. Researchers also recorded two outcome variables, survival-to-hospital admission and survival-to-hospital discharge. The authors did not collect or report data on the neurological status of the survivors. During the study period, medics initiated CPR in 503 patients. Of those, 291 patients met the inclusion criteria of cardiac arrest presumably with a cardiac etiology. For a variety of reasons including early ROSC and unfamiliarity with the equipment, medics did not apply capnography sensors to 149 patients. In addition, 16 cases had interruptions in PETCO2 measurement caused by complications such as mucus, aspiration, and technical errors. The remaining 126 patients, were intubated, had ongoing CPR either by manual CPR (n = 62) or ACD-CPR (n = 64), and had a complete set of PETCO2 measurements. Five minutes after endotracheal intubation, medics selected 44 of these patients for PLR (ACD-CPR = 23; manual CPR = 21). After plotting the PETCO2 measurements, researchers compared three mean pre-PLR readings to three post-PLR readings (Table 1). In each case, PLR produced statistically significant increases in PETCO2 values. Before collecting data, the researchers selected p < .05 as the measure of statistical significance. When p = 0.003, the probability that the same results could occur by chance alone is 3 in 1,000. When p = 0.0001, the probability that the same results could occur by chance alone is 1 in 10,000. Table 2 describes the characteristics and outcomes of the 44 patients who received PLR and the 82 patients who met the inclusion criteria but did not receive PLR. Patients who received PLR tended to be female, had a witnessed cardiac arrest with bystander CPR, and presented in a rhythm other than VF or pulseless ventricular tachycardia (pVT), although none of these difference met the criteria for statistical significance. Despite the fact that PLR produced statistically significant increases in PETCO2 measurements, it did not produce statistically significant increases in ROSC or survival-to-hospital admission. The researchers noted a trend toward higher survival-to-hospital discharge in the PLR group, however the results were not statistically significant and could have occurred by chance alone. Before collecting data, the researchers selected p < .05 as the measure of statistical significance. When p > .05, the difference between the intervention group and the control group were not statistically different and could have resulted from chance alone. In the group of patients who met the inclusion criteria, the research team observed an interesting association between PETCO2 and ROSC. The 60 patients who ultimately achieved ROSC had noticeable increases in PETCO2 values 1 minute before the medics could detect a pulse. Patients who never achieved ROSC had a steady decline in PETCO2 values over the monitoring period. A major determinant of neurologically intact survival following cardiac arrest is the amount of forward blood flow generated during the chest compression phase of CPR (Berg et al., 2010). Forward blood flow is largely dependent on the volume of blood that returns to the heart through the venous system during the relaxation phase of CPR (Pirracchio, Payen, & Plaisance, 2007). The first formal CPR guidelines advocated by the American Heart Association included a statement that "elevation of the lower extremities may promote venous return and augment artificial circulation during external cardiac compression" (American Heart Association, 1974). By 1992, the AHA removed that statement (American Heart Association, 1992). Without specialized monitoring equipment and more highly trained personnel, it is virtually impossible to measure venous return or cardiac output during resuscitation in the field. However, other variables that researchers can measure provide an estimate of venous return. One of those variables is the end-tidal carbon dioxide (PETCO2) level. Poorly performed CPR reduces blood flow to the lungs resulting in low PETCO2 levels. Improving the quality of chest compressions increases pulmonary blood flow causing the PETCO2 values to rise (Pernat, Weil, Sun, & Tang, 2003). Therefore, any intervention that increases PETCO2 values suggests improved flow from the right ventricle to the lungs, which can only occur if there is an associated increase in blood return to the right atrium. Additionally, end-tidal carbon dioxide measurement is a reliable indicator of chest compression quality and an early indicator of ROSC (Sanders, Ewy, Bragg, Atlas, & Kern, 1985). 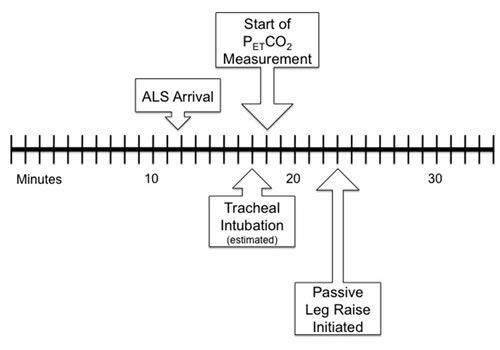 Passive leg raise mimics immediately reversible volume expansion thereby improving venous return in patients with sepsis or acute pancreatitis (Preau, Saulnier, Dewavrin, Durocher, & Chagnon, 2010). Other researchers demonstrated that PLR improves venous return by increasing resistance to blood flow (Rutlen, Wackers, & Zaret, 1981), thereby shifting fluid from the lower extremities into the central circulation (Hofer et al., 2002; Schrijen, Henriquez, Candina, & Pol, 1991). A case report of two patients who suffered cardiac arrest in the out-of-hospital environment demonstrated successful resuscitation following PLR (Ross, 2008). There are several limitations to this study, which could affect how broadly you and your Medical Director can apply these results. First, this observational investigation only established an association between PLR and improved PETCO2 values. Because two variables are associated does not mean that one causes the other. Observational studies such as these are useful for helping researchers establish hypotheses, which they can then test in larger more controlled investigations. Next, a mathematical tactic called a power analysis performed before beginning the project allows researchers to determine how many subjects they need to detect a difference, if a difference actually exists. The authors acknowledge that this study was underpowered and incapable of detecting a statistically significant difference in survival following PLR. The authors did report, however, that they observed a trend in survival following PLR. With statements such as this, authors suggest that the intervention may actually have value even though they could not prove it mathematically. This can be misleading. In formal hypothesis-testing investigations, researchers set the criteria for statistical significance before beginning the experiment. In the final analysis, the results either meet statistical significance or they do not. You must not be fooled into thinking that the researchers came close to proving something existed because of the trend. To paraphrase Master Yoda, there is no close. It is always possible that the intervention is worthwhile, but not based on the results of this investigation. However, since this study was observational and not designed to test a hypothesis, trend reporting may provide some insight into further formal testing and power calculations. Another limitation is the selection process for the study population, which is closely related to protocol compliance. The researchers could not include data from more than half of the patients who met the inclusion criteria because the medics did not apply the capnography sensors or because of monitoring complications. One can only speculate as to the possible outcome if data from that larger group was available. Although the authors report that the strategy used to select the 44 patients who received PLR was "acceptable," there is no description of the process. Without a strict selection process, medics could have inadvertently introduced unacceptable levels of measurement error into the investigation by selecting dissimilar investigation and control groups. For example, medics could judge some patients to be more likely to survive, select those patients to receive PLR, perform deeper chest compression with fewer interruptions, and administer epinephrine sooner than for those judged not likely to survive. Since this study did not measure CPR quality, it is possible that the increase in PETCO2 values observed in the PLR group was because of differences in chest compression performance and not PLR. Regardless, the results of this study suggest an association between PLR and improved carbon dioxide elimination, which is a surrogate measure for cardiac output. The researchers could not demonstrate a statistically significant association between PLR and outcome measures, although the study was underpowered to detect such a change. The researchers also observed marked increases in PETCO2 values about one minute before rescuers could detect ROSC. This association could allow rescuers to minimize interruptions in chest compressions for needless pulse checks. American Heart Association. (1974). Standards for cardiopulmonary resuscitation (CPR) and emergency cardiac care (ECC). II. Basic life support. Journal of the American Medical Association, 227(7), 841–851. American Heart Association. (1992). Guidelines for cardiopulmonary resuscitation and emergency cardiac care. Part II. Adult basic life support. Journal of the American Medical Association, 268(16), 2184–2198. Rutlen, D. L., Wackers, F. J., & Zaret, B. L. (1981). Radionuclide assessment of peripheral intravascular capacity: A technique to measure intravascular volume changes in the capacitance circulation in man. Circulation 64(1), 146 –152.